One of the standout players to watch from the Indian men’s hockey team, Devinder Walmiki would be the go-to-man at the Rio Olympics! A possible excerpt from one of the matches where the commentators raise their tone as the tempo of the match shifts towards India and its players approach the opposition circle. The ball deflects and rebounds to the top of the circle only for ... Look who is in there? It's Dev-in-there! How apt does this rhyme to Devinder, someone who has the penchant for scoring goals at crucial moments of the match. Devinder would be India's redeemer! Devinder’s famous hand stretch closely matches with that of the Christ the Redeemer (statue). Note: I write this with no irreverence to any faith or religion but just to draw parallels with the famous statue that the Indian team visited a few days back in Rio de Janeiro. His hard work and perseverance are unrivalled and can be easily judged by his phenomenal rise in Indian hockey with 41 caps to his name in the last one year and a half. He approaches each game as if he is playing his last match. This hunger factor and passion to outshine others and realize his potential is synonymous with Devinder. He links up play between the attack and defence and also brings the much-needed balance to the team. Goals and Devinder - An indelible relationship! He may not be a prolific goal scorer but if you talk about impact, his goals have had the maximum in recent matches. Devinder has the uncanny knack of scoring goals at crucial moments, be it in the Hockey World League or the Champions trophy. His work rate and performances have been top notch ever since he grabbed the headlines with a debut goal! He was also awarded a cash prize of Rs. 1 lakh by Hockey India for the same. 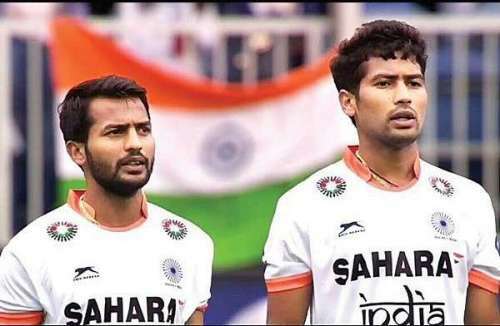 Devinder scored one goal in India's 3-2 win over France in the FIH World League Semifinals in Antwerp, Belgium last December, a game remembered more for Sardara Singh’s famous shimmy and through pass. Most recently i.e. in the 6 Nations Invitational tournament in Spain, Devinder scored in the dying minutes to seal a stirring Indian comeback and help draw level against Argentina. The Walmikis have battled all extremes to earn a name for themselves in the hockey circuit. Perhaps, this is what makes them mentally tough and allows them to cope up with the pressure of playing in big tournaments. Devinder in fact, feels he is tailormade for such situations and will only better his game with every challenge thrown at him. Mezbaan Patel i.e. Bawa Sir, as he is fondly called by everyone in the hockey circuit, spotted both the brothers and later trained and guided them on how to use this magical stick. Otherwise, such raw talent would have been lost at an early stage! The Walmiki brothers – elder brother Yuvraj on the left and Devinder on the right. Earlier we had both the Walmiki brothers in the team but now it is two players packaged in one soul! Devinder looks at Yuvraj as not just his elder brother but more as a mentor! After all, it was he, who introduced Devinder to hockey and backed him during testing times. Junior Walmiki will head to Rio not only to show the world his talent but also to repay the faith shown in him by his mentors – his club coach and brother. Perhaps soon we would have a third Walmiki, Anup - the youngest of the trio who currently plays for the junior team. And with this, we would have a legacy of sorts much like the Tirkeys of Orissa, Singhs from Sansarpur, Uthappas and Thimmiahs from Coorg, as we would now have the Walmikis of Mumbai! He brings the X factor in the team. India’s very first opponents are the green army of Ireland. Despite their low ranking, it would be in no way an easy match. The European team has also consistently improved over the last year and this would be a tough encounter for the Indian team. Hence, a moment of brilliance, by a diving tackle to win the ball and then following it up by running the length of the pitch would be needed. With Devinder in your team, one can be rest assured of many such moments. He is one that will shine as the tournament progresses. Devinder would be eager to make his mark at the Rio Olympics and would be awaiting each match much like the whole team with a lot of anticipation. He is a sage, like his namesake who wrote the Ramayana albeit on the pitch! He reads the game and thwarts every opponent attack. Moreover, he shows his attacking prowess by supplementing the frontline as and when needed. On a whole, his vision and all-round ability would definitely help India at the Olympic games.